CANTON, MA (September 21, 2015) – Dunkin’ Donuts today unveiled an exciting expansion of its espresso beverage lineup, announcing the addition of Macchiato to its menu with the introduction of the new Pumpkin Macchiato. 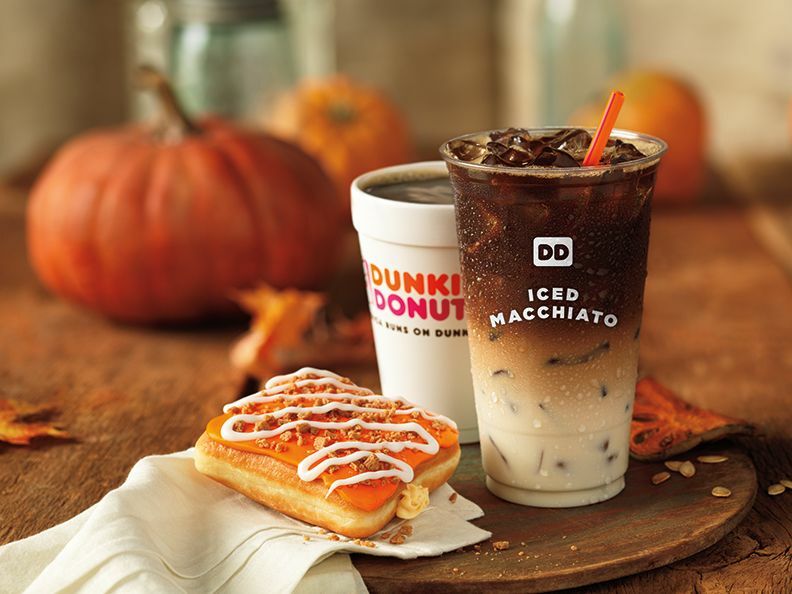 Available hot or iced, Dunkin’ Donuts’ Pumpkin Macchiato is a handcrafted, layered espresso beverage made with steamed milk and pumpkin flavored swirl, then topped with a double shot of Dunkin’ Donuts’ rich, freshly-brewed espresso. For coffee lovers seeking a new way to enjoy a favorite flavor of fall, the Pumpkin Macchiato will be available at participating Dunkin’ Donuts restaurants nationwide by September 28. A permanent part of the brand’s menu, a macchiato can be customized with any of Dunkin’ Donuts sweetened coffee flavor swirls. The Macchiato joins Dunkin’ Donuts’ menu of classic espresso selections that includes cappuccino, espresso, and hot and iced lattes, which are available in indulgent flavors such as Caramel or Mocha. Guests can also add a Turbo Shot® of espresso to any coffee or hot chocolate beverage. All Dunkin’ Donuts espresso beverages are made with espresso beans that are 100% Fair Trade Certified™ and selected from the finest, high-quality Arabica beans. The introduction of the Macchiato comes approximately one year after the launch of Dunkin’ Donuts’ Rainforest Alliance Certified™ Dark Roast Coffee, one of the boldest additions ever to the brand’s coffee lineup. Made with 30% Rainforest Alliance Certified™ beans, Dunkin’ Donuts’ Dark Roast Coffee uses a unique roasting process to create a bold flavor and smooth finish without the bitterness typically associated with most dark roast coffees. For National Coffee Day on Tuesday, September 29, Dunkin’ Donuts is celebrating the 1-year anniversary of Dark Roast with a special free offer: guests can walk into any participating Dunkin’ Donuts restaurant across the country and receive a free medium cup of Dunkin’ Donuts hot or iced Dark Roast Coffee, with a limit of one per guest. This month, Dunkin’ Donuts has another special Dark Roast offer for members of the DD Perks® Rewards Program. Through September 27, DD Perks® members can purchase any size hot or iced Dark Roast for only 99 cents, when they pay using their enrolled DD Card.